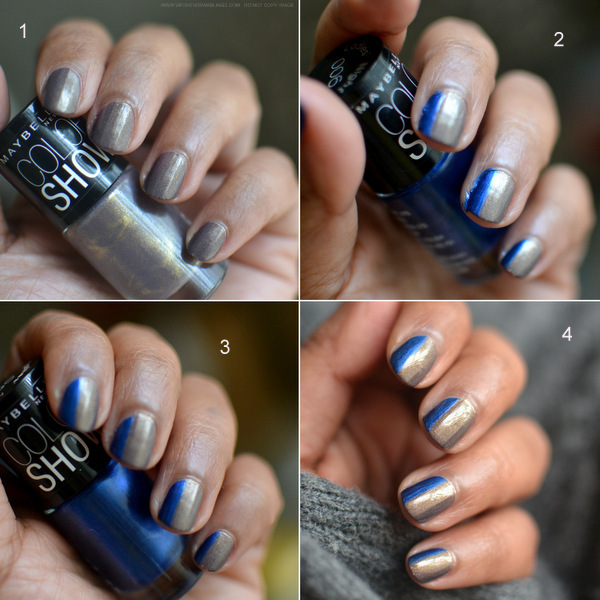 The colors I have used are from Maybelline India's new Color Show range of nail polishes - Buried Treasure (a pewter-bronze metallic finish) and Ladies' Night (a beautiful metallic blue). I wasn't able to get a very accurate photo of Buried Treasure because of its metallic finish. It looks a deeper bronze under artificial lighting. 1. Apply Buried Treasure as a base on all the nails. I have used 2 coats to get a deeper bronze color. Wait a bit for this to dry (doesn't take very long). 2. Apply a thin stripe of the blue polish - Ladies' Night - along the side of the nail. You can apply a tape to get a perfect line, but I didn't bother with it. Just run the brush in one smooth motion from base of nail to the tip. It's okay if you get it around the nail edge - as I have done in the photo. The one important thing to remember is to keep the stripe thin, less than 1/4 of the entire nail width. 3. Take a Q-tip (cotton bud) dipped in nail polish remover and carefully wipe all the excess polish from around the edges. Because this is a dark color, change to a clean Q-tip every time you wipe the polish to avoid staining the skin any more. If you need a more precise clean, use a small eyeliner brush dipped in remover to take off bits of polish that remain after using the cotton. 4. Finish with a top coat to seal in the two polishes and give the nail an even, smooth, glossy appearance. And that's my cleaned and polished nails.